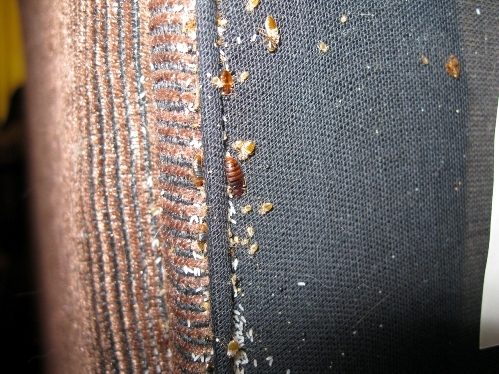 The bed bugs go through a three-stage lifecycle which is the egg, nymph, and adult. They mature fast, and the females are responsible for laying the eggs at a rate of four to seven eggs a day and usually after a blood meal. The eggs are laid in dark places at the edges of the mattress, crevices, bed cracks and a stick on any hard surfaces especially the wood. This makes the spread fast if this furniture is moved to a different place. The females can lay a total of 200 eggs in these isolated areas and shelters especially in dark places. The eggs will hatch within one or two weeks and they newly formed nymphs start feeding on the spot. If the place provides a warm room temperature, the nymph matures within 14 days if they get enough food supply and up to 30 days if they don’t get the desired environment. The nymph then shed the skin up to five times before maturing into an adult. The adults start mating immediately where the females can start laying eggs within 4 to 9 weeks if the conditions and the environment favor their growth. Bed bugs have a lifespan of 6 to 12 months and can feed every ten days on average during this time. They can survive without a blood meal for a long time, and their rate of reproduction is very high thus spreading quickly through a house as they keep on searching for migration if they congest in a place. Bed bugs live in beds, furniture, clothing or spreading. If one of these infested pieces of furniture is moved, then it will carry the bugs, and they will continue breeding at the place where the furniture was moved if the conditions are favorable. These pests are very good at crawling. They can crawl very fast when there is dark. If you happen to feel some bites and decide to put on the night, you can’t even find one as they travel very fast to their hiding places. If your neighborhood is an apartment, the bugs can spread to every home at through the cracks. If one decides to spray, the infested home, the move to the next room or home as they are resilient to many pesticides. This movement happens fast to the neighborhood where you can start hearing complaints of bugs infestation. Bed bugs are so resilient and adaptive in that they can survive for days without feeding, up to seventy days. They can live for several months if well fed. They are very sensitive and search their prey by following the heat from the human body and also sense the carbon dioxide from the mouth as they have a good sense of that. When feeding, they usually pierce the human body and spit some saliva that has some chemical that reacts thus making one insensitive. The chemical is composed of anticoagulant and anesthetic that makes the victim feel nothing until the time they have finished. This adds to their ability to spread fast as they can survive for long till they get another meal. The dark places where they hide during the day makes them unreachable. They can hide in the most protected areas of covered furniture where the pesticide does not reach. When the effect of the pesticide reduces, they come out and breed again. They are clever creatures who have a good sense and can sense danger whenever they detect an anticipated move of a human. It is very rare to see one, and therefore it takes a lot of time to realize your home is infested especially if you are not familiar with the pest. Read about how to get rid of bed bugs. Bed bugs can spread very fast because of the high rate of reproduction. They can infest a whole neighborhood and the worst things are that they can become resistant to the common pesticides. Therefore, the best thing to do if you detect infestation is to call an expert who can get rid of the pests entirely. As you have observed, the rate at which bed bugs can spread is very high, the ability to hide in any simple object that offers some dark shelter encourages the spread. A single infestation can make your home a breeding place if don’t realize early enough. It is, therefore, necessary to take proper precautions whenever you suspect these irritating pests are present. 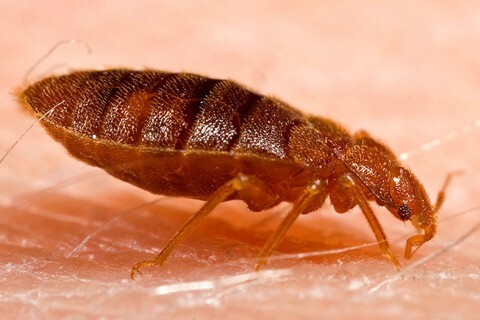 The bite of a bed bug results in itching, but you only feel it when the bed bug has already attacked and left. It leaves some stretch marks on your body which are not pleasant. To spread and fill out the entire home, it can only take some few weeks, and you will not have peace anymore. It is better if you keep your home clean and keep your staff organized making sure there is no clutter left in the rooms which can provide breeding places for bed bugs infestations. Discover the best bed bug treatment here.